Traffic was off to the races earlier in the month until Google Panda took a bit of a bite out of organic search results. Traffic has been recovering since mid-month, so evidently, Google has seen the error of their ways :> and they’re restoring my old search rankings slowly but surely. 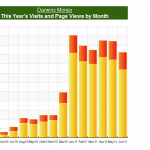 Overall on the month, I matched last month’s traffic at about 25,000 views total. So, overall, this site drove about $2,000 for the month which is nothing to complain about. I make a bit at some other sites I run as well, but this is my primary driver. I don’t have the time to promote my other stuff as much as I’d like, but if you’re interested in investing topics, check out my sites dedicated solely to ETF Investing and High Yield Investing. I’ve previously outlined our foray into Animal House landlording where we bought up 5 properties occupied by 25 dudes who love breaking stuff. The cash flow is good, and their deposits are hefty. So, we’re in the green one month in! But time will tell. We did have a sizable water leak which took a fair amount of efforts to repair but we have a good property manager who banged it out, fixed it up and we got off with only a few hundred bucks all-told. Around where I live, I would have had to do it myself or pay quite a bit more. It’s good to have property managers and trades in lower cost areas! One reason for my inability to spread out into other web properties is the small business I started with an old college buddy. Essentially, we combined his civil engineering background and local family in the Philippenes with my SEO/web experience, and later brought on another partner keen on CPC – all to merge into a rapidly growing AutoCAD Services firm. Why pay an American $50-$100 an hour when you can have the same quality work done for a fraction of the cost by outsourcing? There are a few firms out there competing with us, but we feel we have quite the edge by being US-based and having some really good execution on the web/promotional side. Plus, our drafters are great, very skilled and highly trained. Some of the firms out there provide shoddy work and you have to talk to someone overseas in a different time zone. So, we feel the sky’s the limit, but we’re looking to convert our one-off jobs and leads to larger recurring clients so the revenue/efort exerted starts to increase. For now, we’re investing all our profits back into the firm, but some time next year we’ll start drawing some profits, which will be a nice supplement to my income streams. Congrats on the blogging and rental income. You have an awesome amount of traffic. 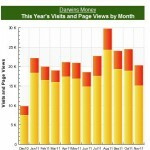 My October traffic was down, but I was not around to help maintain visibility. I am looking to improve in November. 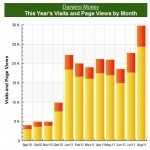 My traffic is growing (as well as my income). It’s always nice. I am getting ready to do my budget as well (I live in the NE and was without power for 80 hours – joy). Thanks for sharing. Glad to hear your month was a success. Not bad numbers. Though I can say Google’s update took a real bite out of my income from the web site. I’m waiting for the cliff; one of my key articles has “2011” in the url. will probably drop off next year, as google’s trying to focus on recent/real-time in their new algo. 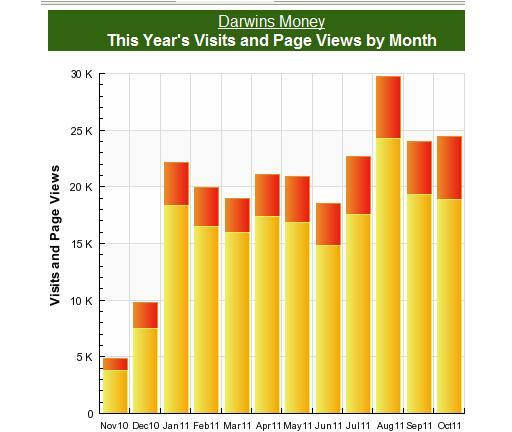 Absolutely awesome Darwin! Always a pleasure to read your monthly reports! Glad you enjoy; I initially debating sharing, but seems like people think it’s worth reading! 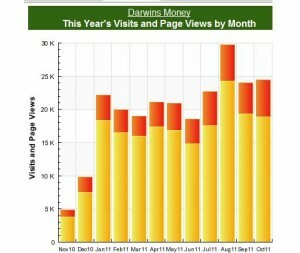 Looks like pretty nice numbers for aprox 20k page views. Congrats on having such a high ecpm rate. Also, with the upcoming Christmas season ecpm rates should continue to increase a little, hopefully giving a little bit extra coffee money. I had about 25K, but yes, the ECPM is pretty nice for a couple top articles in particular; many of my other ones bring in zilch though. Need to diversify a bit! First off, awesome income. $2000 in blog income is defiantly something to brag about because their are not many doing it. My site is generating around $1200 a month which is coming from Adsense and affiliate sales. However as Investor Junkie mentioned above Google did one their updates again and hit some of us hard. Good post I look forward to reading more. Thanks, I’m glad you enjoyed; congrats on breaking $1K per month, that’s a major lifestyle change when you’re able to bring in 5 figures annually on the side! Previous post: 43% Increase in Healthcare Premium for Me in 2012. How Bad Is Yours?